Oil on canvas, 63,5 x 53,5 cm. In 1881, Viggo Pedersen travelled to France, where he was influenced by the Barbizon school and its Romanticist depictions of peasant life in nature. This landscape painting of Brittany lies somewhere in the intersection between an evocative work and a naturalistic observation. The artist has sought to highlight the intense Southern European colours, light and nature with an almost Romanticist sensibility, although it is essentially a nature study. Everything from the diverse foliage of the poplars to the surface of the water is characterised by a great attention to detail and demonstrates the artist’s uncanny powers of observation. 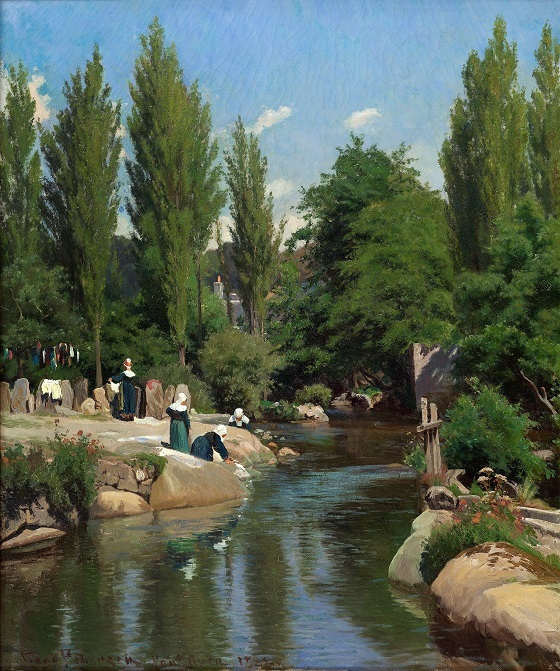 The laundresses show that Viggo Pedersen also sought to capture an everyday situation among the French peasantry. Some are washing the clothes while others are in the process of hanging up the clean clothes on a clothesline between two trees. The roofs of the town can be glimpsed between the tall poplars.